Are Micro Markets Right for Me? 27 Sep Are Micro Markets Right for Me? Do you have bill acceptors on your vending machines? How about cashless devices? Does your company service locations where millennials work? If you answered “yes” to these questions and are part of the convenience services industry, then you must continue to evolve as the needs and wants of our clients emerge. We must be nimble and quick to find the exactly how today’s consumer wants to buy products at their place of work. We must strive to stay a step ahead and today work on what we may need tomorrow or in a year. Nowhere is this truth more obvious than with micro markets. There are a number of factors driving the continuing growth of micro markets. Just think about the bottled beverage segment – fifty years ago having a few selections of ice cold beverages at the workplace was fine! Then came seven button machines, then nine button machines. In the nineties, glass front vendors were introduced that held 40 plus varieties. Today, with the consumers requesting flavor extensions of core beverages, flavored waters, a huge tea variety, RTD (ready-to-drink) coffees, zero calorie and decaffeinated alternatives, energy drinks and many more, we have outgrown the cost effective delivery method of a vending machine. A reach-in cooler can merchandise a large variety of beverages, is very cost effective, and has substantially fewer service issues. For the cost of one glass front vendor, you can place four or five reach in coolers and offer the selection that your consumer is looking for today as part of your micro market. Now think about the candy and snack segment. Forty five is around the usual maximum selection. How are you going to squeeze all the products that today’s consumers want into 45 selections? You need the good old favorites, but also reduced fat and/or low sodium, plus the new “healthier” options. The list of flavor extensions is growing daily, think Wasabi Oreo’s. Food is another consideration, as a wide selection is needed for today’s consumer. They want access to the nutrition information as well as ingredients before making a purchase. If you want to keep location employees at the workplace, you need an enticing selection. But even beyond the staples, what about some sundries, umbrellas, or even phone chargers? The demographics of the workplace are evolving constantly. Younger employees are replacing the retiring baby boomers. Their snacking habits are different, and many don’t carry cash. So what offers more options with product and payment? A micro market! Now, micro markets are not for every client location, you need 100 + employees for a full-fledged setup and at least 50 for a smartphone-powered solution. Plus, you’ll need a location with no public access and a little more wall space than vending. 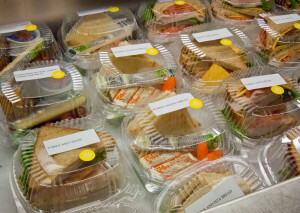 If you currently don’t have a fresh food supplier who can provide nice looking and great tasting $4.00 + sandwiches and entrees, you should find one. When converting a vending bank with a food machine to a micro market, I have seen food sales jump from 8% – 15% of monthly revenue to around 33% +. Just think of chips, a beverage and maybe a candy bar going with most of the food purchases. You can easily see the potential revenue increase. With credit/debit card sales and customer accounts creating your market revenue, your products are no longer confined to 5 cent increments, and you can charge sales tax where applicable. All of a sudden you can mimic c-store pricing! You are bringing the convenience store to the work place, so you can charge their pricing. So why aren’t you taking a harder look at micro markets? The concept isn’t as difficult as you may think. Consumers learn how to use kiosks in minutes, they can manage their accounts via their smartphones, and even checkout from their desk if their favorite item is available. Micro markets and unattended retail aren’t just a fad – they are here to stay. Improved checkout systems and inventory control may be in the future, but the concept of an open, easy to use, well stocked market with self-checkout will just continue to grow! Don’t let this trend by-pass your company. When one of your largest customers calls and says they are leaving you for a company that can provide a micro market, it may be too late. Talk with kiosk suppliers today, and see how easy the markets are to service right within your vend management system. After all, a lot of the infrastructure you need for markets is already in place. 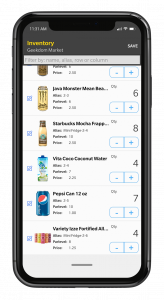 You should be able to route markets right along with your vending, which makes servicing markets even easier. Sure, prekitting is a prerequisite because of the extensive product selection, but that can be accomplished via your VMS. The barriers to success with micro markets are nothing that you can’t handle. Markets are an integral part of the convenience services industry and are rapidly taking over many of the best locations. 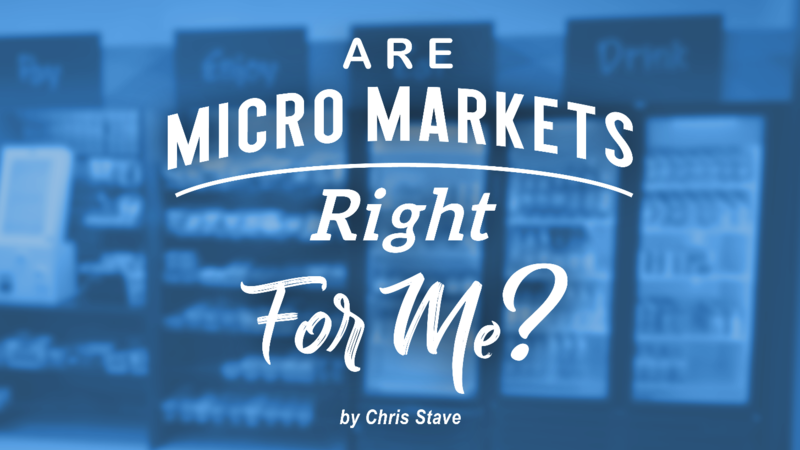 Are micro markets right for you? If you have not explored the options, take a look very soon! Chris has been a pioneer and advocate for vending technology for over twelve years. He got his start as the executive director of the Vend Marketing Institute, a nationwide coalition of operators who worked together on marketing and purchasing initiatives. Vend Marketing Institute was later absorbed by Unified Strategies Group (USG) where Chris was named vice president of technology and innovation. At USG, Chris successfully implemented numerous technological initiatives to help increase cost savings for a network of over 700 member companies with over 1,000,000 vending machines. He joined Parlevel as the Dir. of Business Development to help operators adopt technology to navigate the path to better operational efficiency, improved margins, and sustainable growth. You can reach Chris Stave at cstave@parlevelsystems.com.